Ephemeris for Monday, October 16th. The Sun will rise at 7:59. It’ll be up for 10 hours and 56 minutes, setting at 6:55. The Moon, 3 days before new, will rise at 5:29 tomorrow morning. The stars of the constellations Andromeda the chained princess look like they’re supposed to be the hind legs of Pegasus the flying horse which is high in the southeast at 9 p.m. Andromeda is high in the east She is seen in the sky as two diverging curved strings of stars that curve to the left and up from the leftmost star of the Great Square of Pegasus. Her predicament was caused by her boastful mother Cassiopeia, and the wrath of the god Poseidon. She was rescued by the hero Perseus, a nearby constellation, riding his steed Pegasus. Andromeda’s claim to astronomical fame is the large galaxy barely visible to the unaided eye just above the upper line of stars, the Great Andromeda Galaxy 2.5 million light years away. Andromeda and neighboring constellations that are related to her story. Created using Stellarium and GIMP. Andromeda at 9 p.m. with the Great Andromeda Galaxy. Created using Stellarium. The Great Andromeda Galaxy (M31). Image taken by Scott Anttila. It appears here more extensive than it appears visually to the naked eye or in telescopes. Ephemeris for Thursday, October 27th. The Sun will rise at 8:14. It’ll be up for 10 hours and 23 minutes, setting at 6:37. The Moon, 3 days before new, will rise at 6:02 tomorrow morning. The closest large galaxy to our Milky Way galaxy is the Great Andromeda Galaxy seen in the eastern sky when it gets dark. It is barely visible to the naked eye. To locate it first find the Great Square of Pegasus high in the east, standing on one corner. 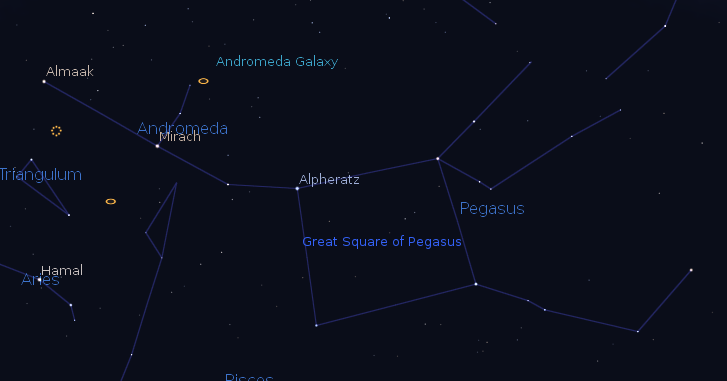 The left star of the square is the head of the constellation Andromeda. Follow two stars to the left and a bit downward, then two stars straight up. The galaxy is near that last star as a small smudge of light. Binoculars are the best way to see it as a thin spindle of light. A telescope can see only the bright nucleus of the galaxy, that spans 6 Moon diameters in photographs. 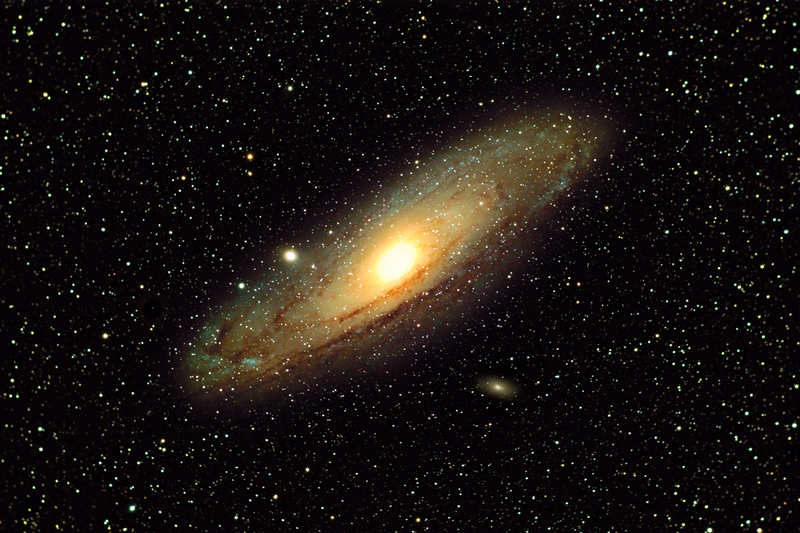 M31 is its first catalog designation and it is two and a half million light years away. Times are for the Traverse City/Interlochen area of Michigan. They may be different for your location. Andromeda in the evening with the Great Andromeda Galaxy. Astronomers called it a nebula before the discovered it was a galaxy like the Milky Way. Created using Stellarium. The Great Andromeda Galaxy (M31) as seen in binoculars. Visually even in a telescope the hub of this galaxy is all that is seen. However it also can be seen with the naked eye. My photograph. The Great Andromeda Galaxy (M31). Image taken by Scott Anttila. Ephemeris for Thursday, September 10th. The Sun will rise at 7:15. It’ll be up for 12 hours and 47 minutes, setting at 8:03. The Moon, 3 days before new, will rise at 5:40 tomorrow morning. In the east at 10 this evening can be found a large square of stars, the Great Square of Pegasus the flying horse. The square is standing on one corner. What look like its hind legs stretching to the left from the left corner star is another constellation, Andromeda the chained maiden. She is seen in the sky as two diverging curved strings of stars that curve upward. She was rescued by the hero Perseus, a nearby constellation, riding his steed Pegasus. Andromeda’s claim to astronomical fame is the large galaxy seen with the unaided eye just above the upper line of stars. The Great Andromeda Galaxy is two and a half million light years away. To the unaided eye the galaxy appears as a small smudge of light. In binoculars the galaxy is a delicate spindle of light. The galaxy is known as M31, the 31st object on Charles Messier’s list of fuzzy objects that aren’t comets. Andromeda at 10 p.m. with the Great Andromeda Galaxy. Created using Stellarium. Ephemeris for Friday, November 14th. The sun will rise at 7:37. It’ll be up for 9 hours and 37 minutes, setting at 5:15. The moon, at last quarter today, will rise at 12:33 tomorrow morning. Yesterday we looked at the closest spiral galaxy to our own Milky Way, the Great Andromeda Galaxy. I said that it would collide with the Milky Way in about 4 billion years. Usually no stars are harmed by such a collision. What does collide are the dust and gasses in each galaxy, that will trigger a burst of star formation. Over the next several billion years the two galaxies will probably merge into one giant elliptical galaxy. The sun at that time will see some changes of life the too. The Earth would by then be uninhabitable because the sun would be too hot, and by then would begin to bloat out into a red giant star. It would be a great spectacle, but no one would be around to watch it. However there are many distant colliding galaxies to watch. Closer to home, Saturday night there will be a star party at NMC’s Rogers Observatory starting at 9 p.m.
Here’s a link to a YouTube video of a computer simulation of the collision of the Andromeda galaxy with our Milky Way galaxy. Ephemeris for Thursday, November 13th. The sun will rise at 7:36. It’ll be up for 9 hours and 40 minutes, setting at 5:16. The moon, 1 day before last quarter, will rise at 11:36 this evening. The Great Andromeda Galaxy that we amateur astronomers usually call M31 is the closest spiral galaxy to our own Milky Way Galaxy. It is actually visible to keen-eyed observers to the naked eye. To locate it, first find the Great Square of Pegasus, 4 stars high in the south that make a pretty good square. From the top left star, Alpheratz, direct your gaze to the first two stars in a slightly curved line to the left to Mirach. Then go two stars up. The last one is a bit dim. But just to the upper right of that last star is a little fuzzy spot. That is the core of the Great Andromeda Galaxy. In binoculars it looks elongated. Photographs show the galaxy to span 6 Moon widths. It is somewhat larger than our galaxy and will collide with the Milky Way in about 4 billion years. The Great Andromeda Galaxy (M31). Satellite galaxy M32 is located at the edge of the disk at 9 o’clock, and another, M110 is located at 5 o’clock. Both can be seen in telescopes, but some distance from the core of M31 and seen visually. Image taken by Scott Anttila. Ephemeris for Friday, October 17th. The sun will rise at 8:00. It’ll be up for 10 hours and 54 minutes, setting at 6:54. The moon, 2 days past last quarter, will rise at 2:47 tomorrow morning. Tomorrow night the Grand Traverse Astronomical Society will host a Star Party at Northwestern Michigan College’s Rogers Observatory from 9 p.m. to 11 p.m. On tap, if it’s clear will be the wonders of both the summer and the autumn skies, The summer Milky Way is still visible moving off to the southwest with its star clusters and nebulae. The autumn sky has star clusters too, including the famous Pleiades, best seen in binoculars or telescope finders, and the wonderful Double Cluster. The autumn sky is also host to the closest spiral galaxy to us the Great Andromeda Galaxy, which will get a whole lot closer in 4 billion years. Come on out to the observatory on Birmley Road, about 2 miles south of South Airport Road. 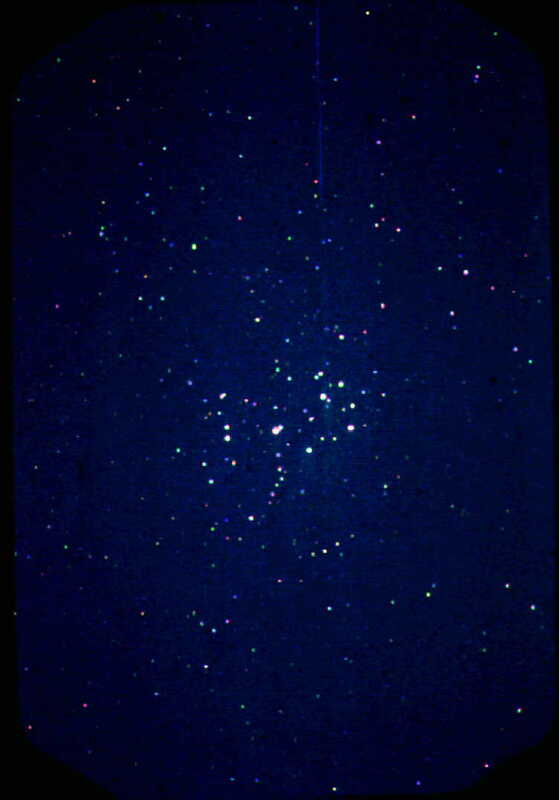 The Pleiades, about what you’d see in binoculars. 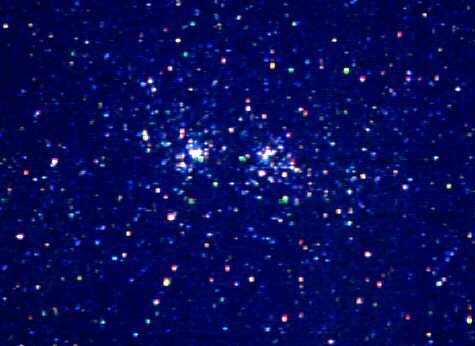 Double Cluster as it would be seen in a small telescope. 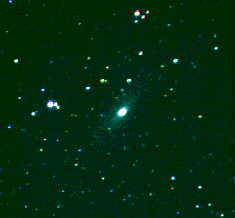 The Great Andromeda Galaxy (M31) as seen in binoculars. Visually even in a telescope the hub of this galaxy is all that is seen. However it also can be seen with the naked eye. However a telescope can also show its two satellite galaxies.